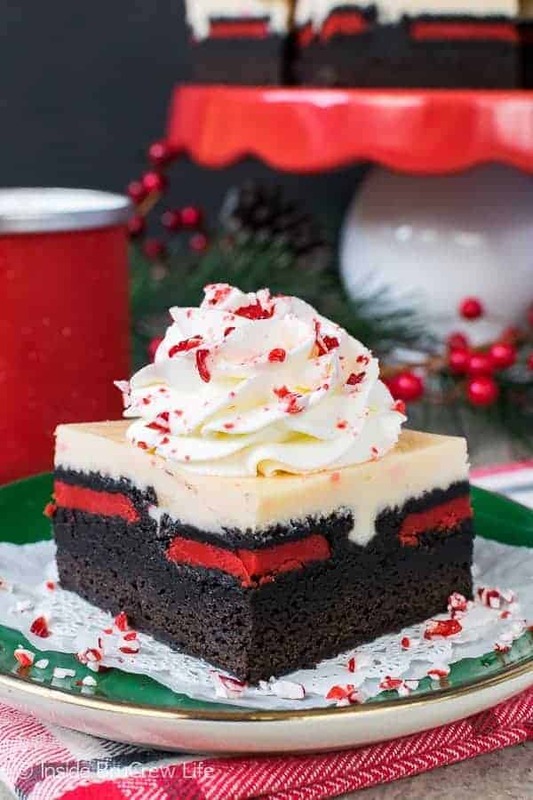 Peppermint Cheesecake Oreo Brownies: layers of homemade brownies, holiday cookies, and peppermint cheesecake will put a smile on your face this Christmas. 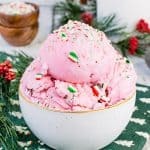 Do not forget the swirl of Peppermint Whipped Cream because it adds just the right touch of holiday love! 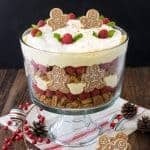 *I am partnering with ADA Mideast this month to bring you a holiday recipe. As always, all opinions are 100% my own. It’s the most wonderful time of year. Christmas decorations are up, and everywhere you go there is Christmas music playing or bells ringing. I don’t know about you, but hearing those ringing bells outside most stores gives me the warm fuzzies. It’s the sound of people giving back because they care. The church that we have been attending for the past few months had a big donation drive earlier this month. We participated by shopping for children from other countries with our two youngest children. They had fun picking out items for each box. They also do different food drives and work days through the year, so we are looking forward to helping out even more. We want our children to see how much it means to help out and give back to others that are in need. My desire is that they will remember these giving moments instead of the gifts under the tree each year. This month I am partnering with the American Dairy Association Mideast for their annual Cooking Together to Give Gallons campaign. They will be donating 25 cents to The Great American Milk Drive for every new follower on Twitter, Facebook, and Instagram through December 13. One click of a button can help so many families in need. Did you know that milk is the number one requested item by most food banks, but it is rarely donated? We go through a few gallons a week at our house. So, I can’t even imagine not having milk available to drink. The Great American Milk Drive will be delivering thousands of gallons of milk because there are so many families in need. The daily recommended dosage for dairy is three servings of milk a day, which is about a gallon of milk a week. Unfortunately even here in the United States there are millions of children and families who only get one gallon per year. If you would like to donate separately, you can do that here as well. Your $5 donation will provide a gallon of milk to one family in need this holiday. 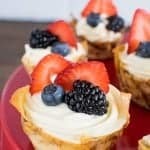 One of my absolute favorite ways to add dairy to our diet is in the form of cheesecake. These fun cheesecake bars staring back at you have three times the dairy goodness in them. That’s right. I included cream cheese, Greek yogurt, and heavy whipping cream in every bite. 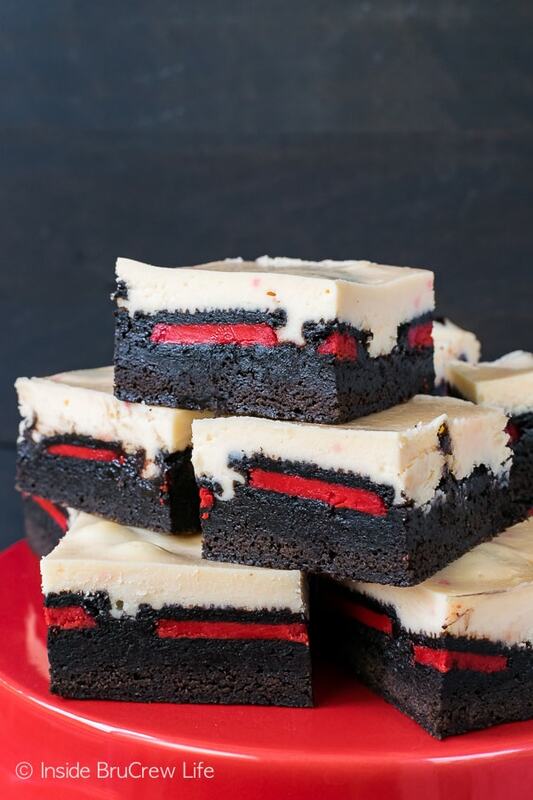 A pan of these cheesecake brownies in your fridge is one way to get your daily dairy intake. This sweet bars start with a double batch of homemade chocolate chip brownies topped with Oreo cookies. I wanted the cookies to really stand out, so I bought the holiday cookies with red frosting. For the cheesecake layer I beat together a mixture of cream cheese, sugar, yogurt, and extracts. To give it even more peppermint goodness, I melted down some white chocolate peppermint chunks and beat that into the cheesecake batter along with some eggs. Before you add your cheesecake batter to the pan, make sure to press the cookies down into the brownie batter until they are even. 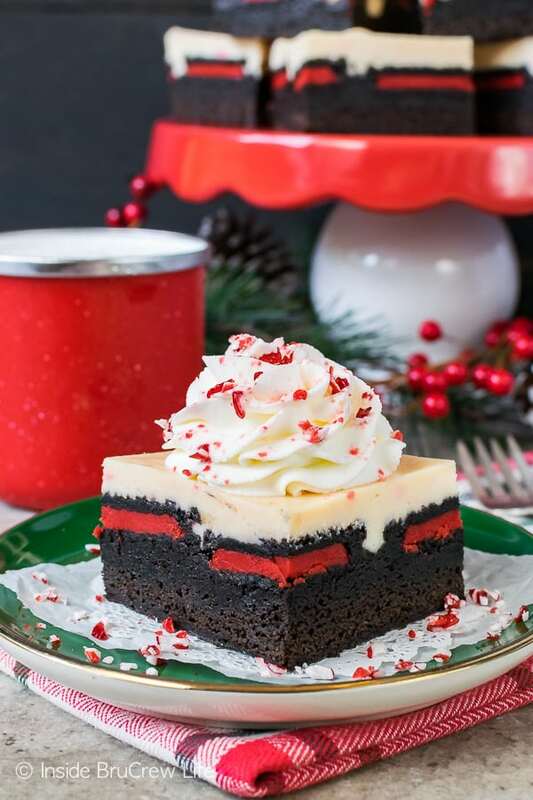 As these peppermint cheesecake Oreo brownies bake, the cookies will start to float up and allow the brownies to bake through the cheesecake layer. Start with the cookies pushed down, so it will keep this from happening. Too much anyway. I did have a few spots around the edges of my brownies where you could see a bubble of brownie mixture baked through the top. Don’t worry if this happens because they still taste amazing! The pan of these fun Christmas brownies didn’t stand a chance in our fridge. One by one these little square of peppermint goodness disappeared. I guess it’s time to bake another batch of brownies. I’m feeling the need for more dairy today. Wink, wink! 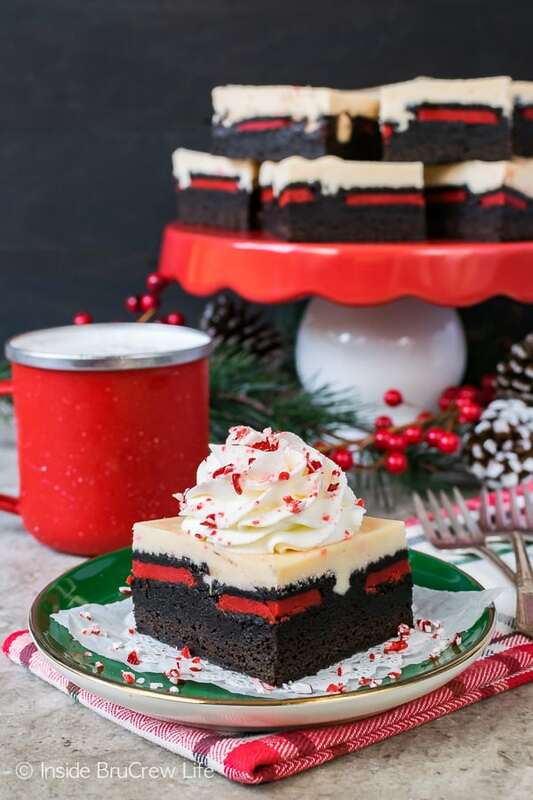 Peppermint Cheesecake Oreo Brownies: layers of homemade brownies, holiday cookies, and peppermint cheesecake will put a smile on your face this Christmas. 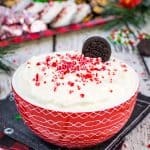 Do not forget the swirl of peppermint whipped cream because it adds just the right touch of holiday love! Preheat the oven to 350 degrees. 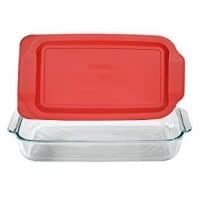 Line a 9x13 pan with foil. Spray it with nonstick baking spray. Beat the eggs and sugar together. Add the vanilla, salt, and butter mixture and beat again. Slowly add the flour and baking powder until mixed in. Spread in the bottom of the prepared pan. Place the Oreo cookies on top of the batter side by side. Using a clean bowl, beat the cream cheese and sugar until creamy. Add the yogurt and extracts and beat again. 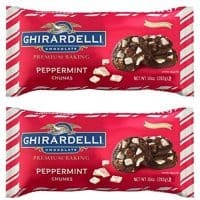 Place the white peppermint chunks in a microwave safe bowl. Heat for 30 seconds and stir. If needed, heat an additional 15-20 seconds and stir again until creamy. Slowly pour the melted chocolate into the cheesecake batter and beat until mixed in. Add the eggs one at a time beating after each addition. Do not over beat the batter. Press the Oreo cookies down into the brownie batter gently. Spoon the cheesecake batter slowly on top of the cookies. Spread the batter out and bake for 45-48 minutes. Do not over bake. Remove the pan from the oven and place on a cooling rack. After 5 minutes, use a butter knife to gently loosen the brownies from the edge of the foil. Let cool in the pan for 1 hour, then refrigerate until completely chilled. Serve the brownies with the peppermint whipped cream and extra peppermint pieces. Makes 24 brownies. Wow! 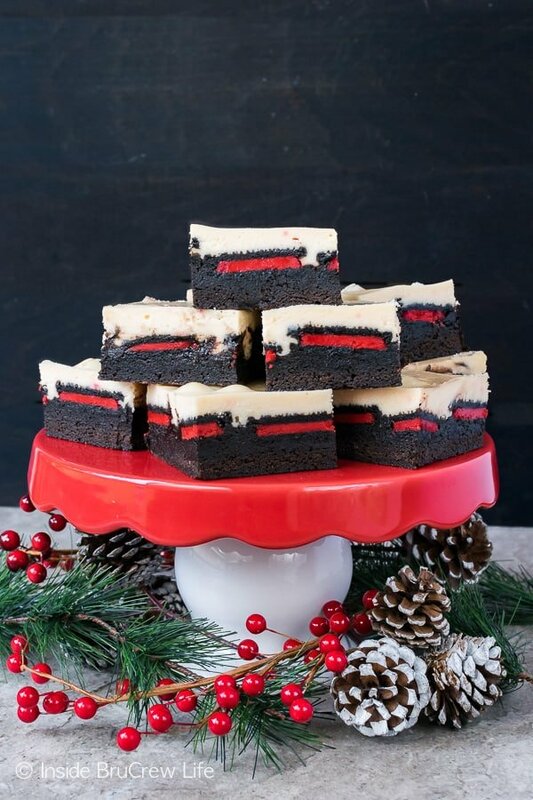 This Peppermint cheesecake oreo brownies looks so appealing. would this workwith a brownie mix to save a little time? You could use a 9×13 box brownie mix, but I would recommend taking the extra 2 minutes to make the homemade brownies. They are worth it. I just made these and my brownies are under baked and my cheesecake part is brown… Any suggestions on what I did wrong? Did you follow the directions exactly as written or change anything? Did you bake them the full 45-48 minutes and then take them out of the oven? If so, I’m not sure why your cheesecake would be brown. Mine wasn’t. Does your oven bake faster when you make other recipes? Everything sets up after it cools completely. I never cut into them until they have chilled in the fridge for at least 4 hours. The only thing I had to change was the white peppermint baking chunks. I couldn’t find them anywhere. I used candy cane kisses instead. I baked them a full 45 minutes. My oven does tend to bake things in the shorter end of most recipes so I used the 45 minutes instead of 48. I let mine chill for two hours, it was completely cold. Unfortunately I had the exact same experience as the lady above. I too had to substitute candy cane kisses, and baked the brownies for 45 minutes because the cheesecake layer was browning. I chilled mine for four hours. The brownie layer was very raw. I am so stumped as to why both of your brownies would be raw. 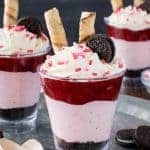 I have made so many different versions of brownie cheesecakes and never had a raw brownie when I have done the homemade brownie layer. You did do the homemade brownie layer, right? I have had slightly raw brownies when I have used a boxed brownie mix, but not so bad that we didn’t devour them. Also, what kind of pan are you using? Glass or metal? I’m just trying to figure out what is different? 1) In the description of this recipe you mention chocolate chip brownies as the bottom layer. There is a link to that recipe. But in the peppermint cheesecake brownie recipe the brownie part does not contain chocolate chips. 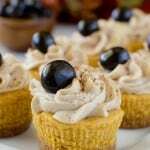 Do you recommend to use the recipe with or without the chocolate chips? 2) Can these be made in advance? If so, how long? And, how do you store them? You can make them with or without the chocolate chips. Either way would be delicious. I usually make cheesecake brownies a day or two before serving them. They do keep in the refrigerator for a few days. Yes, I used the homemade brownie recipe. I used a glass 9×13 pan. I am stumped too!